We looked at a half dozen expert reviews, and thousands of reviews from users, to find the perfect kitchen scale. When it comes to performance, versatility and value, the consensus says that these are the clear standouts. 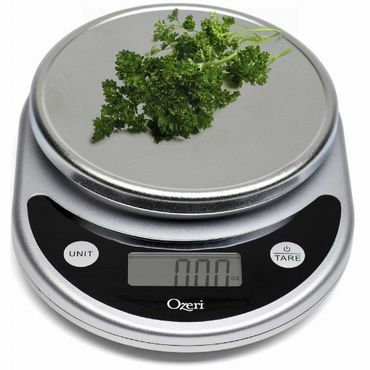 The Oxo Good Grips Food Scale boasts a large, sturdy platform, a unique pull-out display that allows users to weigh ingredients on large platters or bowls without obscuring the display, and a handy tare function. It measures up to 11 pounds in increments of 1 gram or 1/8 ounce, and the platform is removable, making cleanup a breeze. It also has a slim design for easy storage. The Oxo operates on 4 AAA batteries and is backed by Oxo's satisfaction guarantee. If you don't want to spend a lot of money on a food scale, the Ozeri Pronto Digital Multifunction Scale is a terrific value. Reviewers are impressed by this scale's accuracy and appreciate that it can weigh in various units including grams, ounces, and pounds. Its tare function eliminates the weight of a bowl or plate for accurate ingredient weights. The Ozeri uses 2 AAA batteries and is backed by the manufacturer's one-year, hassle-free warranty. Aside from helping dieters control portions, kitchen scales can actually improve cooking and baking results. That's because the "dip and sweep" method -- filling a measuring cup, then leveling it off -- that many cooks use isn't particularly accurate (experts say it can be off by as much as 10 to 20 percent), easily affecting the flavor and texture of foods. In contrast, the accurate measurements of a kitchen scale ensure a recipe will turn out the same every time. As a bonus, you can also use a kitchen scale to weigh letters and small packages. Food scales come in two types: mechanical and digital. Mechanical food scales are analog devices that display readings with a needle pointer. They contain a clockwork mechanism of small springs and pieces, which makes them potentially fragile, though well-built examples can last for years, or even decades. The other significant downside is that their analog nature limits their precision. Digital kitchen scales, on the other hand offer more precise readings and are less cumbersome to use, reviewers say. Some have convenience features such as unit conversion (ounces to grams, for example) or a tare function that will automatically subtract the weight of a measuring cup or other container. Most are battery powered for easy portability, but an AC adapter may be included or available as an option. Like any electronic device, malfunctions are always a possibility, but better food scales are typically covered by a one-year or longer warranty. Among digital food scales, one standout is the Oxo Good Grips Food Scale With Pull-Out Display (Est. $50), which comes out on top in a roundup of 10 digital kitchen scales conducted by a leading cooking magazine. Testers say it has all the features they look for in a good digital kitchen scale: accuracy; a large, sturdy platform that that can be removed for washing; an 11-pound capacity; and a bright readout. The Oxo Good Grips Food Scale earns accolades from reviewers at TheSweetHome.com and Fine Cooking magazine, where editors praise its backlit pullout display, which can be detached from the base to prevent it from being obscured by a large bowl or platter. 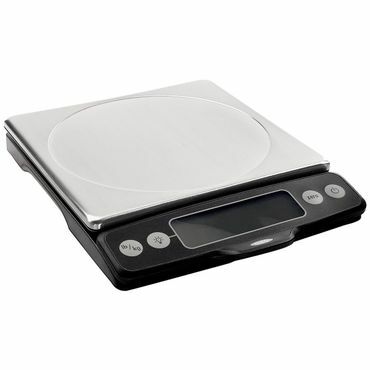 At Amazon.com, the Oxo Good Grips Food Scale has a rating of 4.6 stars out of 5 in nearly 950 owner-written reviews. Most praise the food scale's slim design and easy-to-use tare function, which zeroes out the weight of the container holding the ingredient. An indicator clearly displays how much weight is left on the scale before reaching its 11-pound capacity, making this kitchen scale especially useful for adding multiple ingredients to the same bowl. The kitchen scale measures in increments of 1 gram or 1/8 ounce. Reviewers also appreciate the ability to turn off the display's backlighting to conserve battery power when it's not needed (it's powered by four AA batteries, which are included). However, we did see a few complaints about the Oxo's display failing within a year of regular use or less. That said, OXO offers a satisfaction guarantee that promises a replacement or a refund if a product fails due to a defect under normal use, and some users report success in contacting the company and obtaining a replacement. If you need something with more capacity, the otherwise identical OXO Good Grips Stainless Steel Food Scale with Pull Out Display, 22-Pound (Est. $70) ups the weight limit to 22 pounds. These days, it seems like everything is becoming connected to the Internet, and you can add kitchen scales to that list. The Drop Connected Kitchen Scale (Est. $80) comes with an interactive recipe app and is recommended in recent reviews by DigitalTrends.com and the U.K-based publication The Independent. User reviews aren't extensive, but we did spot more than 80 at Amazon.com, where it receives a rating of 4.2 stars. Reviewers like that the app offers access to hundreds of recipes with interactive, step-by-step instructions, with options such as adjusting recipes to accommodate ingredient limitations and portion sizes. The food scale runs on a lithium-ion battery, and the manufacturer offers a full refund within 20 days of delivery. On the downside, the scale doesn't have a built-in display, meaning you'll need to have your device handy, and at the time of this writing, the app is only available for iOS (recent generation iPad, iPhone and iPod) devices. If spending $50 or more for a kitchen scale seem like overkill for your culinary needs, there are a number of models with fewer features and less pizazz, but that perform well and cost substantially less. For example, the Ozeri Pronto Digital Multifunction Kitchen and Food Scale (Est. $15) earns praise from consumers and professional testers alike, earning a rating of 4.6 stars out of 5 following more than 9,500 owner-written reviews on Amazon.com. Most say they're impressed with this digital food scale's accuracy, ability to measure in a variety of units including grams, ounces and pounds, handy tare function for eliminating the weight of a bowl or plate, and a small footprint that doesn't take up much counter space. It runs on 2 AAA batteries and is backed by Ozeri's one-year, no-hassle warranty. Editors at one professional cooking magazine highly recommend the Ozeri Pronto, noting that it's accurate and easy to use with a bright, easy-to-read display. It's can measure up to 11 pounds and down to 0.05 ounce or 1 gram, according to editors at DigitalTrends.com, who praise its precision and low cost. However, there are a few detractors at Amazon.com who say that this food scale is not as accurate as they'd like, and some say that larger plates could obscure the display -- something that's not an issue with the Oxo Good Grips Food Scale With Pull-Out Display. While all of the food scales above are somewhat portable, the Oxo Good Grips Healthy Portions Analog Scale (Est. $13) puts portability front and center, which makes it an ideal choice for dieters on the go. The included bowl, which serves as the food scale's platform, can detach to snap over the rest of the unit to create a slim profile that can be slipped into a bag or pocketbook; it also makes for easy storage in a crowded cupboard or even a kitchen drawer. However, that also means that the bowl, which functions as the weighing platform, is small and doesn't hold large quantities. This food scale can also only weigh small quantities and its capacity is limited to 16 ounces (broken down into 1/8-ounce increments). That makes the Oxo more suitable as a scale for dieters interested in portion control rather than as a kitchen scale for measuring out ingredients for a family meal. Still, it fills its role admirably. It earns solid feedback from nearly 90 owners posting reviews to Amazon.com. Owners like its easy to read display, with both U.S. and metric measurements. Other pluses include a tare function, and that the bowl is dishwasher-safe and BPA-free. Since this is a mechanical scale, there are no batteries to worry about. As with our top-rated digital scale, Oxo guarantees its products are free of material or workmanship defects under normal household use with appropriate care and offers replacements or refunds for defective products. Cook's Illustrated, Fine Cooking magazine, ChefSteps.com and TheSweethome.com all conduct hands-on, professional testing of kitchen scales, evaluating tested models on accuracy, ease of use, the readability of their displays, stability, and ease of cleanup. We also consulted several food scale reviews in other publications such as TheKitchn.com, DigitalTrends.com, and the U.K.'s The Independent. Finally, we turned to owner feedback on sites like Amazon.com, where we read thousands of owner-written reviews on dozens of food scales, offering feedback on performance, accuracy, and ease-of-use in real-world conditions.